Fusion welding consists of placing a hot metal wedge (hot shoe), mounted on a self propelled vehicular unit, between two (2) overlapped sheets of liners such that the surface of both sheets are heated above the polyethylene’s melting point. 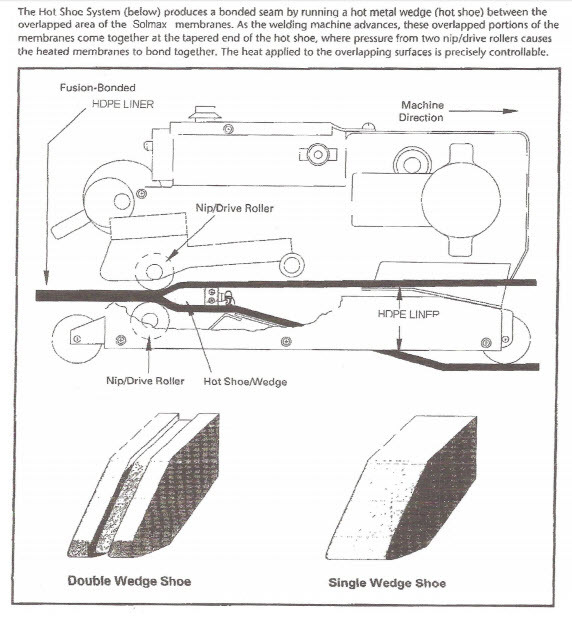 As the machine advances, these overlapped portions of the liners come together at the tapered end of the hot shoe, where pressure from two nip/drive rollers which compress the two (2) sheets together to form the weld. The fusion welder is equipped with devices, which continuously monitor the wedge temperature and machine speed. The heat applied is precisely controllable. Monitor operating temperatures via digital readout. Form uniform bonds by applying consistent pressure to the seam areas. Reduce surface tension and remove surface contamination without grinding, which improves seam strength. Ensure high reliability, which results in consistent seam integrity. Minimize operator error, as the machine is semi-automatic. Surfaces shall be clean and dry. Test welds shall be performed prior to field seaming each morning and afternoon. The overlap between liners shall be at minimum 4 inches. The two sheets shall be straightened to keep the seamed edges smooth and wrinkle-free.